of Christ Church Oxford. For the whole film, and more about the project, go to the EDOX website. 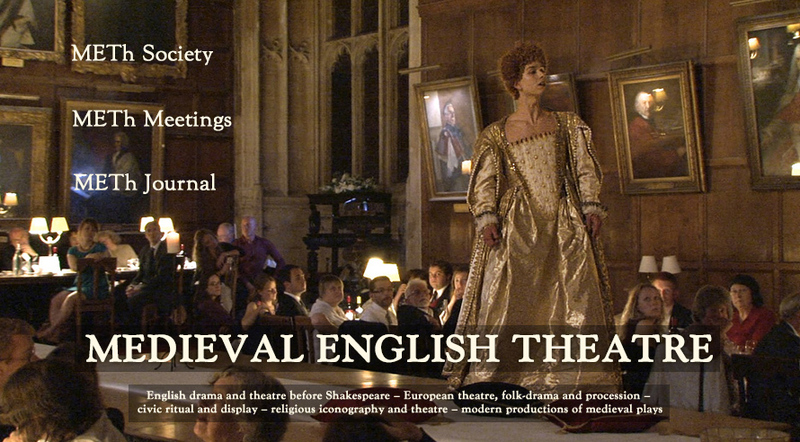 Medieval English Theatre is a society which exists to promote interest in and study of early theatre both within and beyond the academic community. Since 1979 it has published an international refereed journal, Medieval English Theatre, now one of the leading publications on medieval and Tudor theatre up to the rise of the commercial playhouses and the suppression of the civic religious drama. The journal is now distributed by the publisher Boydell and Brewer. METh also organises an annual conference meeting each year at a different location in Britain and on a different theme. For further details and the Programme see the 2019 Medieval English Theatre Meeting webpage. On 11 April there will be a Postgraduate and Early Career Symposium run by the Early English Drama and Performance Network (registration free but space limited).